These are the Bird Wrasses, named for their prominent physical beaks as much as their flitting swimming behavior. These are fast moving; moderate sized (males to about a foot) fishes that do very well in mixed fish species systems. Two species in the genus. 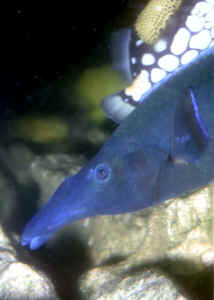 Gomphosus varius Lacepede 1801, is the much more common Bird Wrasse (1) in the west. Its males are lighter green over-all, and females transversely white to black front to back, with an orangish upper "beak". The common Bird Wrasse is found in Hawai'i to the tropical western Pacific and eastern Indian Ocean. At right, a juvenile in Hawaii. Below: Female in Hawai'i, an intermediate individual (changing from female to male), a male there and one in captivity. A grouping of female G. varius off of Kona. Almost constantly soaring about like their avian counterparts, skimming the make-up of their environment, brilliantly colored and amusingly shaped, sharp-eyed for food items, predators, and aquarists. These are the Bird Wrasses, named for their prominent physical beaks as much as their flitting swimming behavior. These are fast moving; moderate sized (males to about a foot) fishes that do very well in mixed fish species systems. Surprising to most folks, there are two species in the genus, each known with little awareness of the other by Europeans or Americans. The Indian Ocean and Red Sea Gomphosus caeruleus is almost exclusively traded in European markets, whereas G. varius, found in Hawai'i to the tropical western Pacific and eastern Indian Ocean, is mainly available in the west. Both these species attain about the same size, have similar habits and care requirements. 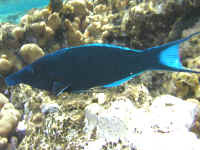 Bird Wrasses are neither small, nor greatly easygoing, and are best kept with other mid-sized fishes of an outgoing nature. Small fishes, or ones that are too shy to compete for food, and 'bite-sized' invertebrates like small shrimps cannot be easily kept with Gomphosus spp. The Bird Wrasses are NOT easy to collect (all are wild caught), being very quick and smart, avoiding fence nets that are strung up along the bottom to drive marine fishes into. Once they 'hit the net' their capture is not guaranteed, as these are amongst the few species that are wily enough to swim over the 'float line' or seek egress from the bottom 'lead line'. An adept collecting diver will look to hand-netting Gomphosus from the barrier/fence net first to both secure this worthy catch, and also reduce consequent physical trauma to the specimen/s. As a potential buyer, you'll do well to check for collateral damage from this process, as well as the harrowing effects of being held in cubicles, tanks prior to shipping, and the difficult process of bagging and shipping. 1) Check prospective Bird Wrasse buys carefully for signs of apparent physical damage. Torn fins, missing scales are generally easily repaired over time, but damage to the mouth and eyes should disqualify a purchase. Almost all mouth-damaged and nearly all eye-damaged wrasses perish within days to a few weeks. 2) As a related matter, don't be overly eager to buy 'just arrived' specimens of Gomphosus. Often these fish are only a day or two from being captured, and may well show signs of damage a few days hence. If necessary, ask your stockist/dealer if they will hold a given individual for you, perhaps with a good faith deposit, for pick-up in a week or so. 3) Size matters! Unless you have a very large system (hundreds plus gallons) with little present livestock, do select for smaller specimens to start with. These ship and adapt far better than large males'¦ which brings us to the pertinent fact that these fishes like other wrasses are synchronous (versus simultaneous) protogynous (first females) hermaphrodites'¦ they start off as females (initial state) and change at a later time (depending on food availability, social circumstances'¦) into males. So, buying a healthy female, you can expect in time to have a male. Even small specimens of Bird Wrasses need room to move. These species are capable of incredible bursts of speed, and can and do easily damage themselves at times by running into the walls of their enclosing aquariums. A minimum size for them is a two-foot wide by four-foot long system, six foot long for mature individuals. Akin to their propensity for rapid movement, their tanks need to be completely covered. MANY end up as so much 'floor jerky', having launched themselves out through a small opening or uncovered tank. Filtration/aeration/circulation need to be brisk. During the day/light period Gomphosus require fully oxygenated water to sustain their aerobic activity. During nights/lights out time, they mainly settle down in a crook/crevice to sleep, possibly even under the substrate. Providing hiding/sleeping spaces and adequate depth, shape/texture sand substrate is important. A few caves, arrangements of rock, and smaller diameter coral sand are ideal. If the whole system cannot be fitted with this sand, a given deeper (a few inches) area should be set aside for their use. Hardy damselfishes, medium to larger marine angels, batfishes, Soldierfishes, basses of good size, these are suitable fishes in terms of compatibility. Anthias, butterflyfishes, most cardinalfishes'¦ will not get enough to eat in a tank with Gomphosus. Bird Wrasses do not consume stinging-celled animals, preferring mollusks, small fishes, echinoderms and worms mostly in the wild, so strictly speaking they are 'reef safe' fishes, though they will consume smaller shrimps given the chance. Bird wrasses do fine kept one to a tank, and can be kept as 'pairs' (one female, one male), or if your system is very large, a group of females, but do maintain just one male per system. Bird wrasses are far from finicky feeders and will gluttonously consume all formats of foods in great quantities. In fact, there is typically very little, make that no training time required acquainting Gomphosus with novel foodstuffs. As a practical measure, you may well have to feed your Bird Wrasse in one corner while simultaneously trying to get food to your other livestock. We have already mentioned the incidental damage and mortalities due to capture trauma and habitat limitation; Bird wrasses are amongst the toughest, most biologically disease-resistant of fishes, though they can fall prey to hyperinfective parasitic disease. Happily, Gomphosus are also susceptible to cure by the usual environmental manipulation and chemical treatments employed for the majority of marine fishes. Given a few weeks careful quarantine, and/or a pH-adjusted freshwater bath between shipping and placement, it is rare that they will carry pathogens into a new system. So distinct that most marine aquarists can pick them out by sight, Bird Wrasses have a great deal to offer as larger fish, and rough and tumble fish and invertebrate, even some types of reef systems'¦ given enough space, evenly-matched tankmates, and a setting with hiding spaces and substrate to rest in. Baensch, Hans & Helmut Debelius. 1994. Marine Atlas, v.1. MERGUS, Germany. Emmens, Cliff W. 1985. Wrasses. TFH 7/85. Randall, John E. 1983. Red Sea Reef Fishes. Immel Publishing, London. 192pp. Randall, John E. 1996 Shore Fishes of Hawai'i. Natural World Press, OR. 216pp.